A day full of love, fun, "and lots of dancing"
It wasn't the most conventional of proposals. 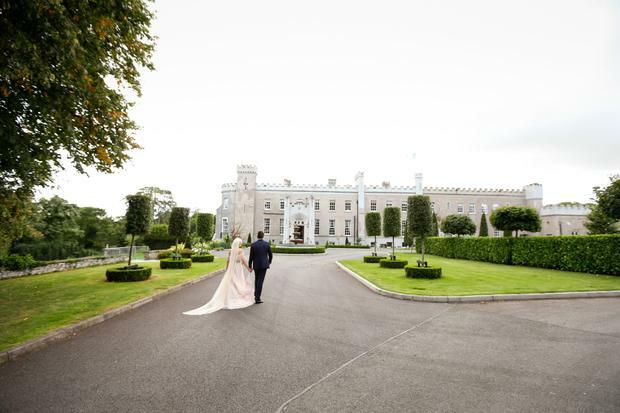 Proving there's no right or wrong way to do relationships and weddings, Orla and Aaron had already booked their wedding venue - Bellingham Castle in Louth - before they actually got engaged. After keeping the fact that wedding preparations were already in full swing from their friends and family, Aaron eventually got down on one knee in the bay window overlooking the sea at his parent's 'home away from home' in Annagassan, Co Louth, and asked Orla to marry him. The couple's big day was to be 'full of love and fun and lots of dancing'. 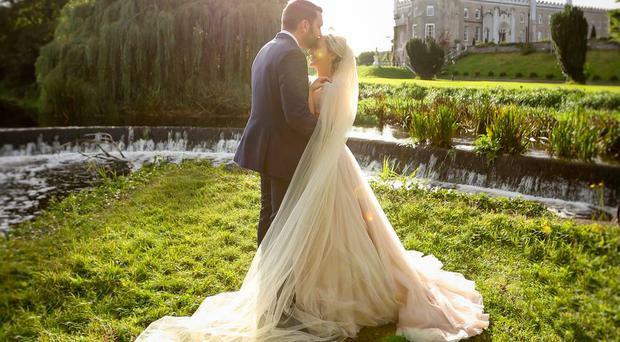 "We didn’t get too hung up on any one thing we just went with our gut," says bride Orla about the planning of it all, "it meant we didn’t waste a lot of time checking loads of different options. We just wanted little hidden details all over the place that represented us and who we are. And I wanted to do a lot myself because I like arts and crafts." Their wedding photos are by Will O'Reilly. 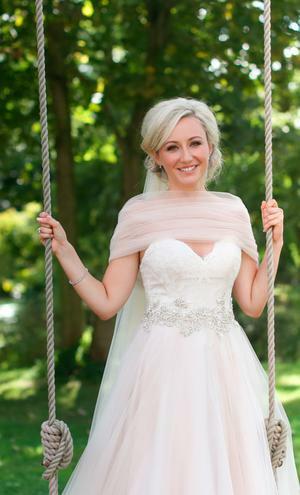 Orla bought her wedding dress was bought in Frilly Frocks in Drogheda after at first finding shopping for the dress 'a little overwhelming'. "I knew what I didn’t want but not quite what I wanted," she said, "I just knew how I wanted to feel." "I work in fashion and so I love clothes and see such gorgeous designs, I can change my mind a lot. 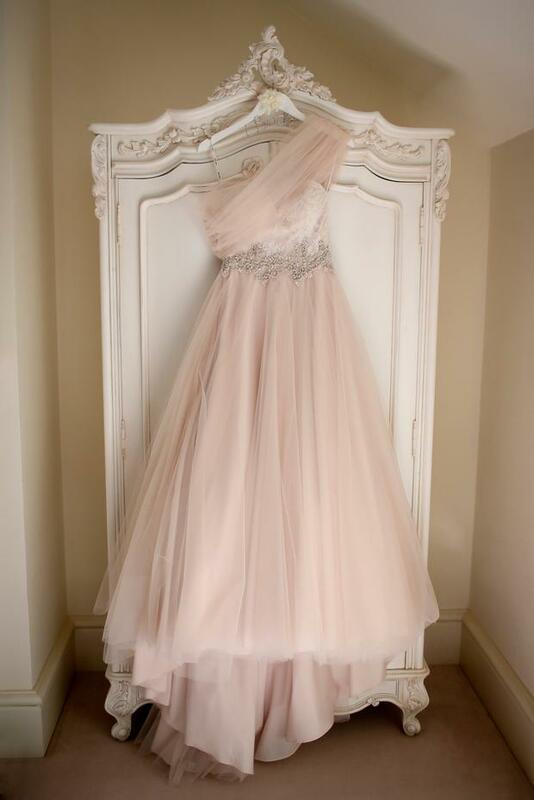 But Frilly Frocks were amazing along with their alterations team to help me alter and customize the dress to the way I wanted." The bridesmaids wore dresses by Jenny Yoo which Orla got online at BHLDN.com, and the groom and groomsmen's suits were Louis Copeland. 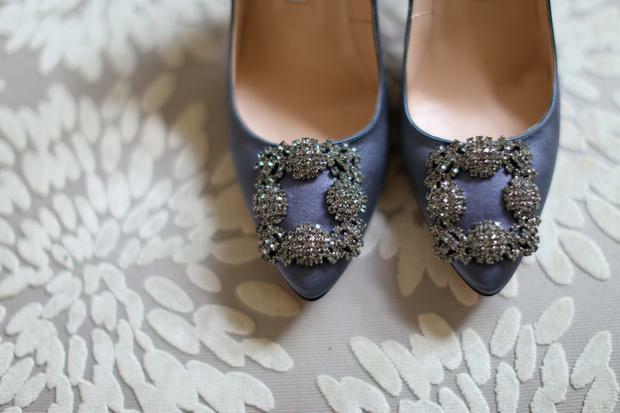 Orla's 'something blue' on the day were her beautiful Manolo Blahnik heels. 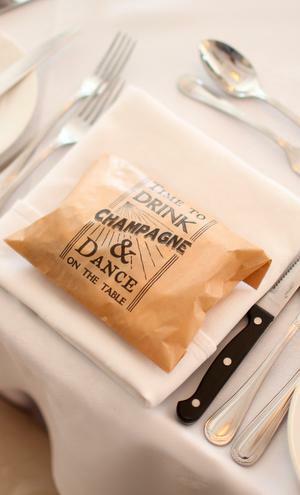 Being a big fan of arts and crafts, the bride took on a lot of DIY projects for the day. The invites, table plan board (which was made using wallpaper from the couple's first house) and mass booklets were done with the help of family and friends ("and a great bridesmaid" Orla adds). "One of our groomsman is a carpenter so he had a log so Aaron and himself cut the logs for our center pieces one day. Then Aaron carved/burnt little notes into the wood, with some very special images for family members that are longer with us. Myself and my friends collected jam jars to then decorate for the flowers to make up our centerpieces." 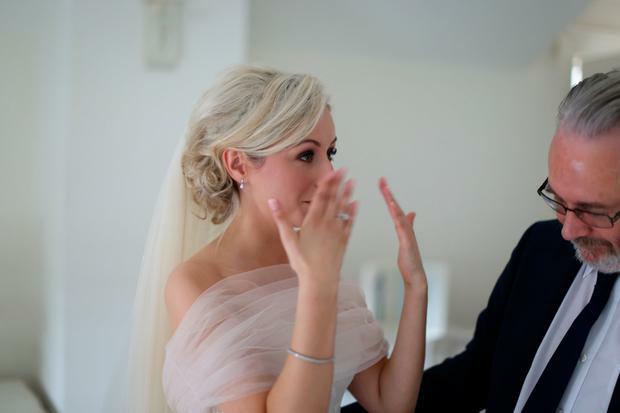 "It was all just subtle little hints around the room that really just meant a lot to us. Some might call us mad but we did it for us most people probably didn’t even know but we didn’t care!" 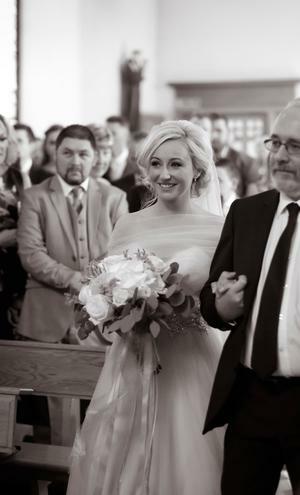 For Orla, saying her vows was a moment she'll cherish for a lifetime: "God the whole day from start to finish was better then I could have ever anticipated but the church for me was such a special part of the day especially saying our vows along with the dancing." For Aaron, after spending the morning with more nerves than he would have liked he says: "Walking out of the church a married man and seeing everyone’s happy faces" may well have been his favourite part of the day. 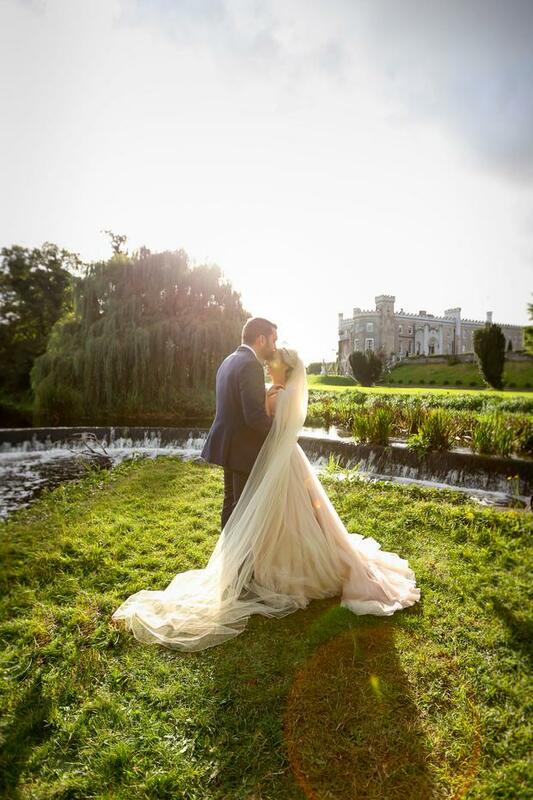 The couple tied the knot in Bellingham Castle, with the bride staying in Bellingham Estate the night before the big day. The venue held a special place in their early lives together. "Aaron’s parents had an apartment up in Annagassan and you have to drive through Bellingham to get to it," reveals Orla. "It was always a little get away for us. The castle was recently done up so we decided to check it out. After meeting the amazing staff especially Ciara and the gorgeous Irish wolf hound - we're 'dog people' - we didn’t look at anywhere else." "We wanted to go for something that most people would enjoy, nothing too complicated just warm delicious food that was done really well. 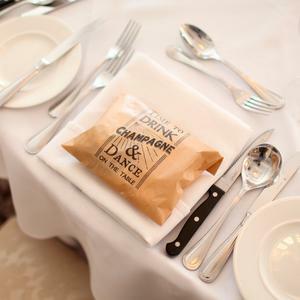 Everyone couldn’t stop talking about the delicious food for the day which was so lovely." "Saying our vows," Orla says is one of her favourite moments from the day, "seeing everyone’s faces in the church... and the speeches were so lovely. "The weather was amazing and I remember looking around and seeing everyone enjoying themselves in the gardens listening to our saxophone players they were brilliant. We also had such a fun moment walking into the ballroom to a song from Ferris Bueller’s Day Off (the bus scene) Then just dancing the night away. It was so much fun. " "Enjoy the moments, the process, all the little bits..." Orla advises, "it’s a build up to one of the best days of your life. Ground yourself on the day and soak it al in. 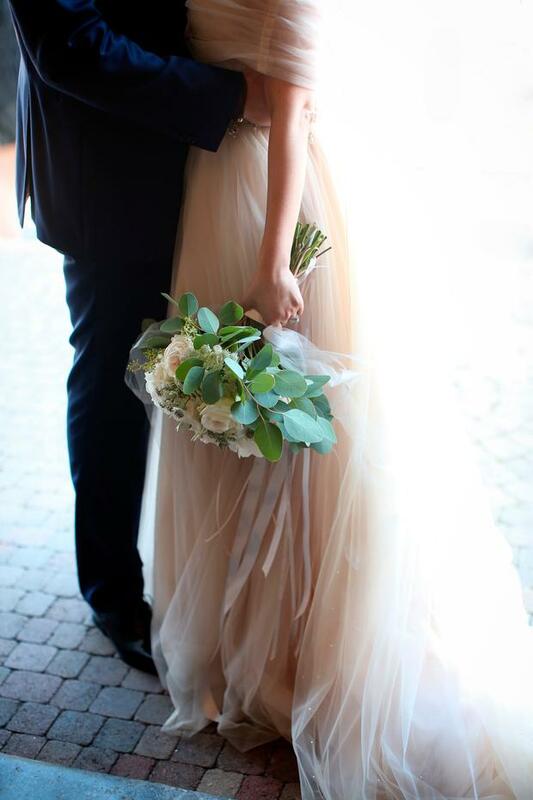 Also make sure you click with all your suppliers they will be with you on such an important day and if you are at ease with them they will set the tone of your day also. We could not have been happier with everyone. Really it all comes down to the people." 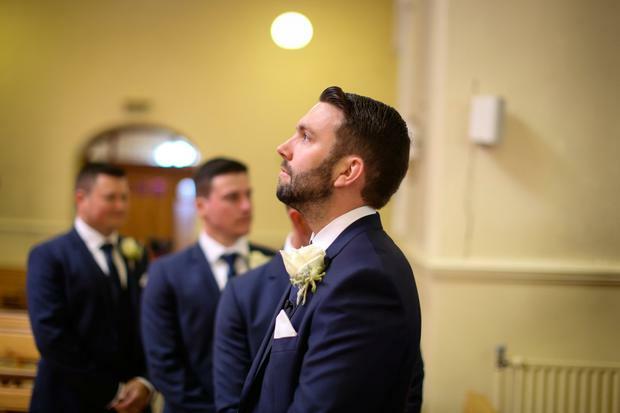 Orla and Aaron went to Mexico on honeymoon, after booking it just two weeks before their big day. 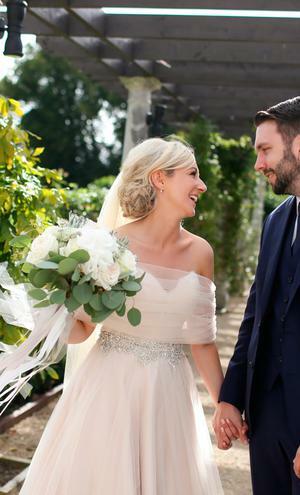 "We weren’t sure if we were going to go away," says Orla, "my mom had gone through a lot before our wedding but all ended so well so It was so lovely to relax finally, it was exactly what we needed."